They say you should never meet your heroes. Today, I just did that. 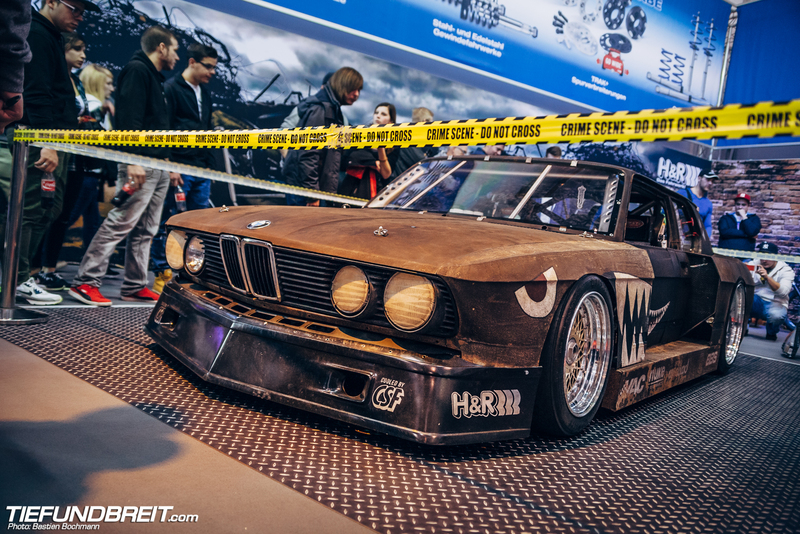 And I can say, that advice is rubbish… because Rusty Slammington – the BMW pictured here – definitely delivered. 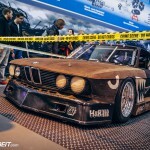 I first heard of this car about, oh… 7 years back on bimmerforums.com where Mike Burroughs, it’s owner, used to post. 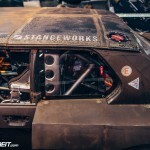 Things swapped over to Mike’s own forum Stanceworks back in 2009 when he founded it. 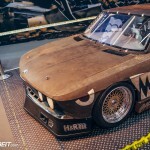 Back then it was just a lowered black E28 on some cool HRE wheels – and already people were getting upset about the car because Mike pushed the boundaries of what was acceptable in terms of wheel fitment back then. Life happened – Mike let a friend borrow his car and there was an accident where the A-pillar was damaged. 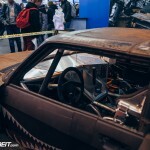 Instead of letting that be the end of the car, Mike decided to have fun with it and in the process created a car that was truly his own. 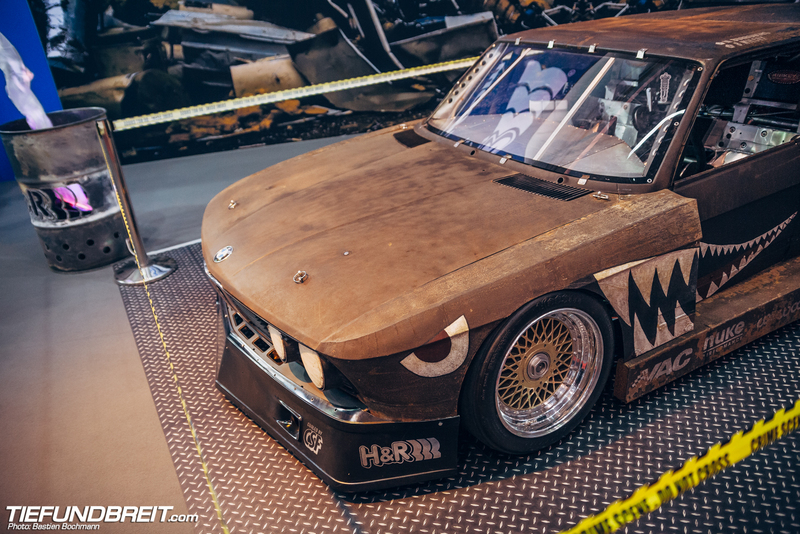 The E28 became known as Rusty Slammington when it’s body panels were intentionally rusted-out – a bit later it was sporting a roof chop and a Toyota JZ turbo-engine. It was not to be, though. 4 years ago, a garage fire destroyed Mike’s garage – with the car in it. “I guess Satan just wanted his car back” as Mike put it. However, even back then Mike stated that Rusty would live again. 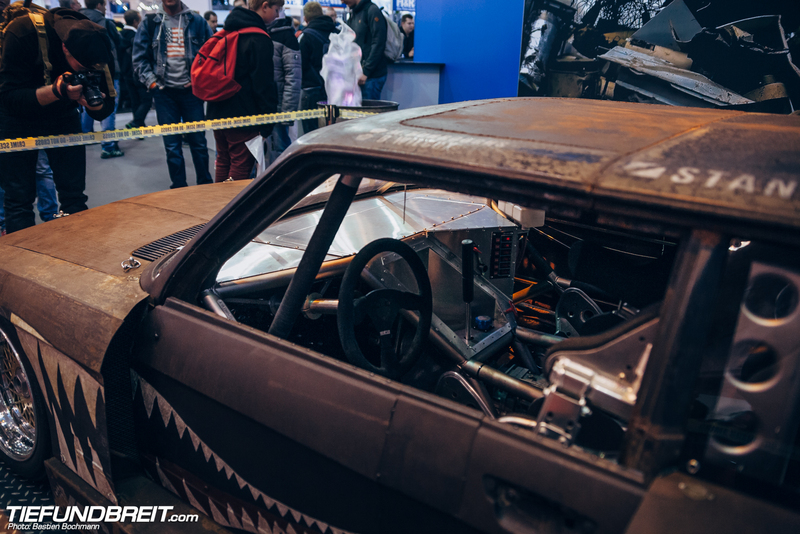 It took 4 years, but Rusty has finally risen from the dead – and in the process, it has become more than a car. 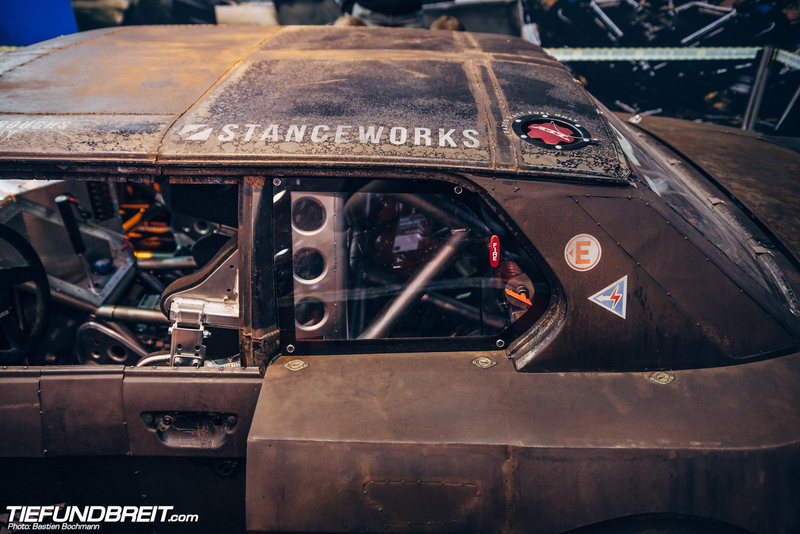 The end result looks like a vintage Group 5 racecar dropped into the world of Mad Max. I would say it has become a piece of art – but while that is certainly true, it does not entirely describe what I think Rusty Slammington has become. 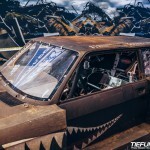 In my eyes, Rusty has become a symbol – a symbol for any true car guy out there: to never give up, to build your car to your hearts content, to not spare a thought to trends or conventions, in short, Rusty has become a symbol of freedom. Now, I’ve followed Rusty’s progress ever since Mike started posting about the car. I remember seeing each new version of the car and being amazed every time how one car could change so much and yet remain the same. With Mike and Rusty living in the US of A, I had never seriously thought I’d get to see it in the flesh some day. 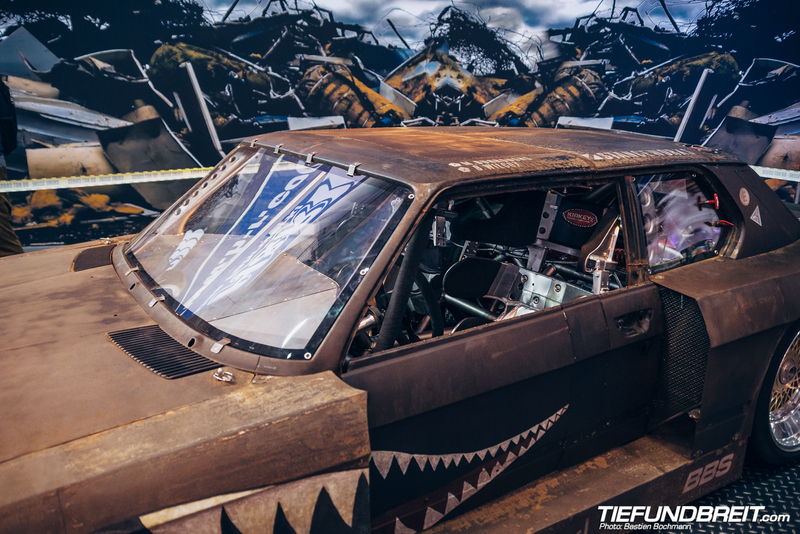 Imagine my surprise when I heard rumors that I wouldn’t even have to make the trip to the US to see the car – nay, the ressurrected Rusty Slammington would be coming to Germany! 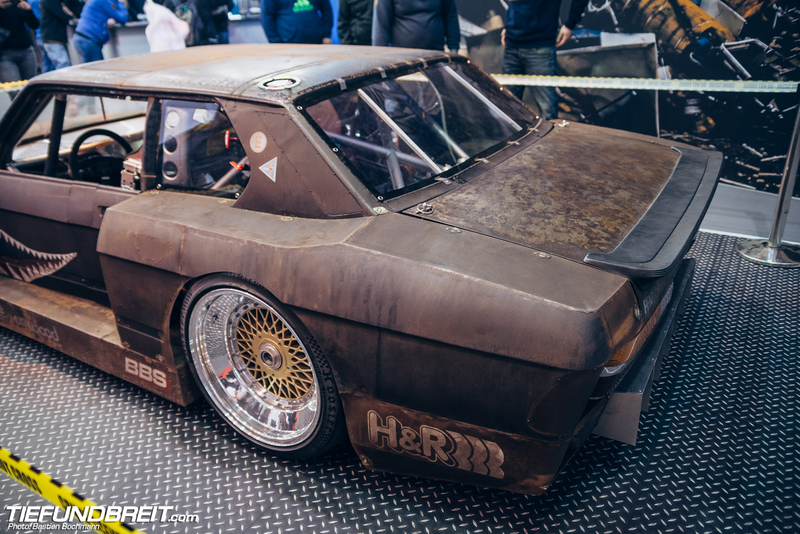 The car was displayed at the H&R booth at Sema this year and it seems H&R must have really liked the people’s reaction’s to it as they brought it along to the Essen Motor Show (which is being held currently, more on the show will follow later). Mike and Byron made the trip as well and it was a pleasure to meet them – and finally get to see Rusty. And Rusty has definitely become a master piece. I was impressed by pretty much every single bit of it. Every spot I looked at, I found new details to marvel at. 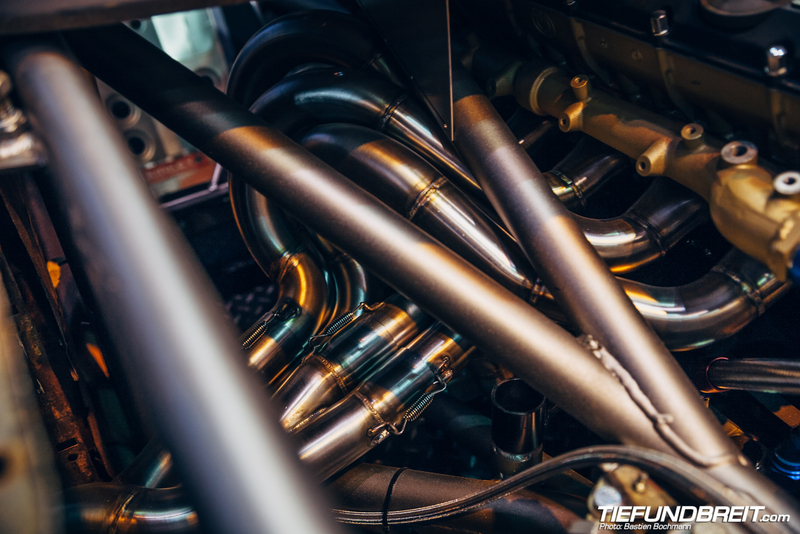 Now, I realize that there are definitely other builds of this caliber or even more crazy out there – but to me, they just do not carry the same meaning that Rusty does. Like I said, to me, Rusty has become a symbol. Mike definitely has created something special here. I know the car is surrounded by a lot of controversy because it’s so far from the norm – but to all the nay-sayers, I urge you to go look at it in person and speak to Mike and Byron about it. Maybe then you will finally understand. 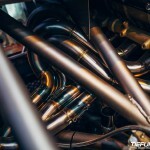 I will spare you the technical details of the car and instead link you to the build thread on the Stanceworks forums here. Go check it out. Mike can tell you better about the car than I ever could. In the mean time, enjoy the rest of the pictures.